A dense shrub with lustrous, dark green foliage. This is a female cultivar. Tolerant of full shade and shearing. Adapts to a wide range of soils as long as drainage is good. 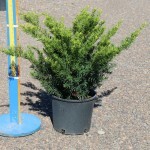 Excellent choice for use as a formal low hedge or foundation planting.